Make room! Crafter, teacher, and designer extraordinaire Tanya Thomann is taking over some Spun space on Saturday, May 4, with a sweet collection of her high-quality handcrafted bags in need of a good home. 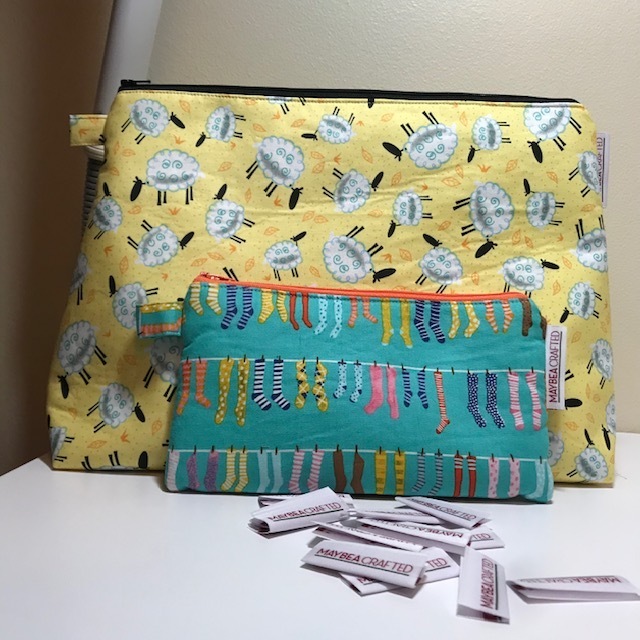 The Box Bag: A zippered fabric box that easily holds a pattern, needles, and worsted weight yarn, with a seatbelt handle that fits over your wrist so you can easily take your work out in the world. The Notions Bag: A zippered bag to organize your odds and ends and keep your tools close at hand. Each MayBea Crafted bag is interfaced with batting for stability, fully lined with contrasting fabric, and finished without raw edges or exposed seams. And we’d be remiss if we didn’t point out that each bag has a non-crafty application (a secret identity, if you will): The Box Bag makes a perfect dopp kit or shoe bag. The Poppins Bag begs to hold a few toddler toys, toiletries, or electronics accessories. The Notions Bag is ideal for keeping makeup tidy and contained. So please make some room in your home and in your bag-loving heart, and make plans to join us on Saturday, May 4. We’ll have Tanya’s goodies in the shop all day, and we’ll celebrate all things handmade and colorful with a wee springtime reception from 4 to 6. Sign up for our eNews! We respect your privacy. We will not share this list with any third party and will only send info about Spun in our eNews.